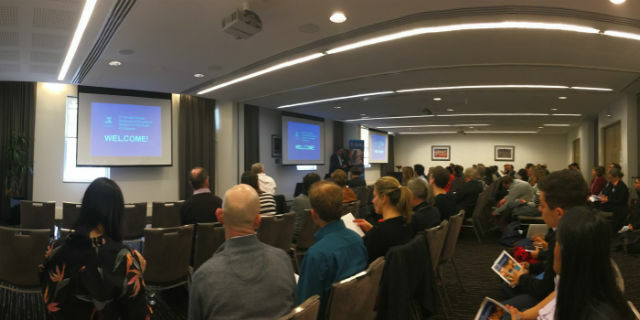 The 2016 Victorian Showcase of Educational Research in Health Professions gathered an engaged community of educational researchers to showcase some exciting new ideas developed as part of local clinical education programs and led by the EXCITE team at The University of Melbourne. The Victorian Showcase of Educational Research in Health Professions began in 2014 to provide an opportunity for Masters students enrolled in the University of Melbourne EXCITE program, Monash HealthPEER, and Royal Australian College of Surgeons (RACS) Surgical Education program to present their research. Since then, it has grown into a forum for healthcare professionals to share, discuss and collaborate on educational research, and this year has been the biggest yet. This year, more than 100 healthcare professionals and educators attended the 2016 Victorian Showcase at Graduate House organised by the University of Melbourne EXCITE team. It saw the largest number of presentations yet with 22 in total split into three concurrent themed streams across two sessions. The themes and types of research presented covered a wide-breadth, including ‘Stigma in clinical learning contexts’, ‘Simulation and clinical learning’, and ‘Experience of learning and education practice’, and types of research included original research projects and systematic literature reviews through to ideas for future research. This unprecedented number of presentations likely reflects the growing community of local healthcare professionals with an interest in education. As in previous years, 10 Masters students enrolled across all three programs presented their yearlong research projects and competed for the Victorian Showcase of Health Professions Education Research Prize. Congratulations again to Dr Rhea Liang (RACS Masters of Surgical Education) for winning the Research Prize with her presentation titled “Factors affecting women choosing to leave surgical training”. A high commendation goes to Ms Catherine Chanter (EXCITE Masters of Clinical Education) for her presentation “Collaborative requesting and organ donation conversations: experiences, attitudes and practices of trained requesters and treating clinicians” who came second by only 0.2 of a mark! Keynote presentations were provided by Professor Joanna Bates, Professor at University of British Columbia and a prominent leader of medical education; and Professor David Beckett, Professor of Education and Deputy Dean of the Melbourne Graduate School of Education, The University of Melbourne. Professor Bates’ presentation “Exploring the dark matter of context in health professions education” and Professor Beckett’s “Translating Educational Research into the Workplace” were both highly engaging and generated stimulating questions during discussion. Thank you very much to the Organising Committee (EXCITE: A/Prof Clare Delany, Ms Erin Turner, and Ms Michelle Curtis; Monash HealthPEER: A/Prof Elizabeth Molloy, and RACS: Professor Debra Nestel); to our session chairs and prize markers who graciously provided their time at the Showcase; to our keynotes, Professor Bates and Professor Beckett; to our Masters students for completing such high-quality projects; to Professor Steve Trumble (DME) for his ongoing support of EXCITE and the Showcase; and to all attendees for an engaging and energetic evening. We are currently in the process of evaluating the showcase and potential options for hosting another next year, so stayed tuned for more.